On the way home from a dinner party, Lorna Love steps into the path of an oncoming car. When she wakes up she is in what appears to be a hospital – but a hospital in which her nurse looks like a young Sean Connery, she is served wine for supper, and everyone avoids her questions. It soon transpires that she is in Heaven, or on HVN. Because HVN is a lost, dysfunctional spaceship, and God the ageing hippy captain. She seems to be there by accident… Or does God have a higher purpose after all? I'm always looking at discovering new books and authors in many different genres. My reading taste, I admit, needs to be broadened and this is something I have been working on. 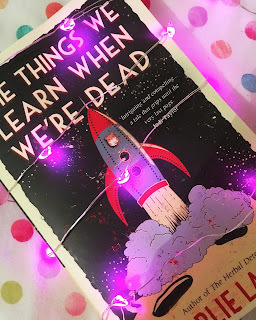 When I got an email from Charlie Laidlaw offering me the chance to read his book The Things We Learn When We're Dead, I was a bit skeptical. Did I really want to read something that wasn't in my comfort zone? The answer to that was yes. So, I went into the book with a very open mind. Lorna Love, a trainee lawyer and supermarket employee is hit by a car on her way home from a dinner party. When she wakes she is in what seems to be a hospital with a nurse that looks like Sean Connery and is served wine for supper. It soon comes to pass that she is in Heaven, or HVN. HVN is a lost spaceship and God is an ageing hippy captain. She seems to be there by accident, or so she thinks. As Lorna's memories return she realises that she has a huge decision to make and that she may need to find a way home. Reading this book was such a pleasant surprise and I'm pleased to say that I really enjoyed it. The idea of Heaven being a dysfunctional spaceship and God a hippy was a work of genius. I commend Charlie for his incredible imagination. I would have never been able to come up with something as complex as that. Hooked? I certainly was! I didn't want to stop reading. The story begins just before Lorna is hit by the car and throughout the book we learn all about Lorna and her life; from her growing up in North Berwick, her relationship with family and friends, training to be a lawyer and finding her place in her small part of the world. The narrative flicks between flashbacks of Lorna's life and her new place in Heaven. I'll admit I enjoyed the flashback segments more but that's only because I became so invested in Lorna as a character. Lorna was a joy to read about. She was someone that I became so captivated by and I just wanted to know more and more about her. She was so real and it was easy to just be swept away by her journey. Whatever emotion Lorna felt, I felt too. She was that much of a three dimensional character. Yes, some of her decisions were unwise and you know in your heart she could have done better. However, humans all make mistakes and thats how I saw Lorna, as a human. The Things We Learn When We're Dead I feel is a story about acceptance and hindsight. It also makes you realise that whatever choices you make in life don't just impact you but others around you as well. It made me think and re-evaluate my life believe me. I love books that bring a positive aspect to your real life situation, so thank you, Charlie. The Things We Learn When We're Dead was a pleasure to read. It's filled with wonderful, perfectly built characters and a great plot to polish it all off. Oh and Hamsters in space? I am so on that idea! Charlie Laidlaw is the author of two novels, The Herbal Detective (Ringwood Publishing) and The Things We Learn When We’re Dead (Accent Press).